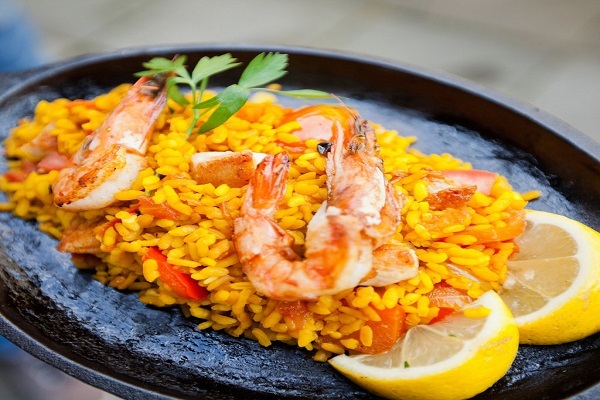 Rice preparation with meat, vegetables and seafood also a national dish of Spain, which has now reached into every kitchen of food lovers around the world to become a daily meal. What Biryani is to Hyderabad is what Paella is to Spain, both are equally luscious delicacy and a must try for every foodie. I have given detail information in my earlier post regarding origin, history and types of paella, so here I will keep it short and give only the recipe and method for cooking it. First thing before we get started with the recipe, please note that paella is not pronounced as “paa-e-lla” but as “pa-e-ya” or “pah-eh-uh”. Second thing paella is not at all a complicated dish like Biryani, which is hard to prepare and takes lots of time, but an affordable dish which can be easily made at home within 30 minutes. Don’t let this misguide your or give any wrong impression that paella is inferior to Biryani, no it is not, both are equally delicious and are class apart. 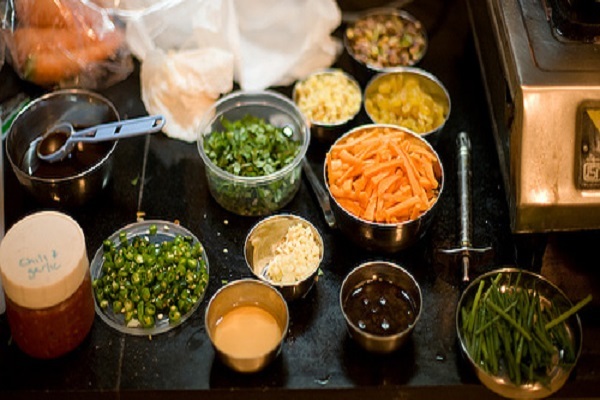 Paella is a dish which is made in one go, so all the mise-en-place should be done before hand and all the ingredients should be kept ready. Prepare the Sofrito with the authentic recipe and don’t mess with the ingredients, sofrito is the heart of any paella, if you spoil the sofrito you will spoil your paella. Select proper rice i.e. Bomba rice or any other rice of that quality. Always choose fresh seafood and vegetables, so that it won’t loses its color during the cooking process. Select wooden spatula for stirring and serving to avoid metallic taste. Prepare over open fire, gas burner or barbecue, cooking over open fire with cone pines along with branches of orange and pine is very good as this gives additional flavor to the dish. 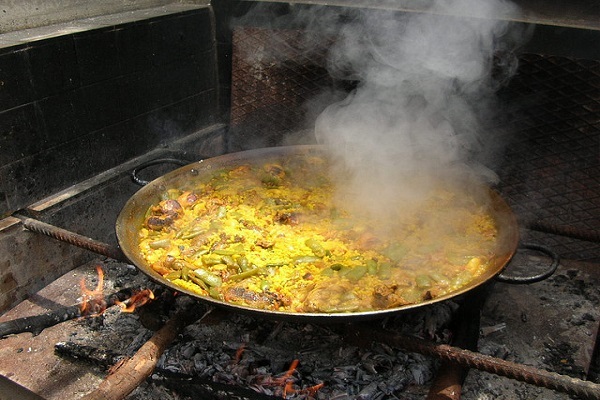 Also open fire is suggested as the paella pan is wide and not shallow so it is very hard to cook evenly on a gas burner if the pan is very wide. Also don’t underestimate the importance of stock, so select proper stock for cooking paella. If you are making seafood paella the select seafood stock, if you are making Valencian paella then select meat stock. It is suggested to make the stock by yourself instead of buying from market and if you don’t know how to make stock, stop right away, you don’t have the permission of the gourmet world to make paella or any other dish for that matter, go to the nearby restaurant and order your paella or whatever they are serving in the name of paella. Period. Select proper Paellera for the cooking. The size depends upon your requirement, it should be at least 5 cm. in depth and 10 cm. in diameter with two looped handles, splayed sides and made of steel. Paellera made from cast iron is most preferred and traditional due to its fast heat conductivity and as a reactive metal, which also influences the flavor of the paella. Having a flat wide paellera with thin dimpled base is very important. 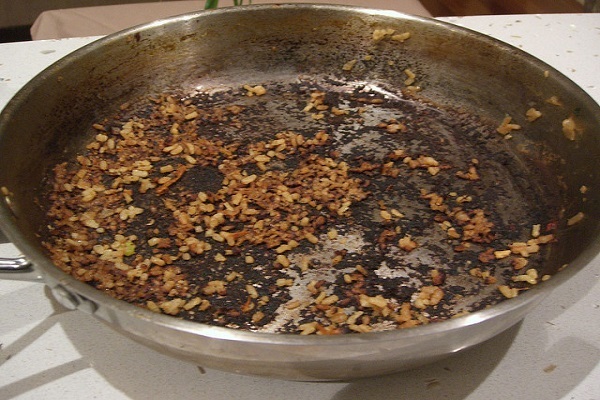 If the pan base is too thick it may result in uneven cooking of the rice. Thick base will delay the conduction of heat which will result in less evaporation and more time consuming. 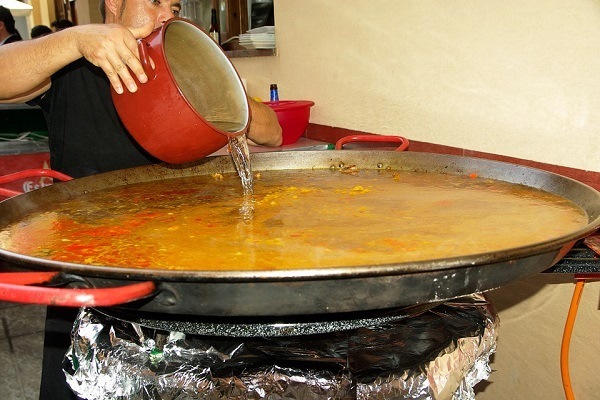 The height of the paellera places a very important factor in achieving the Socarrat while making paella. 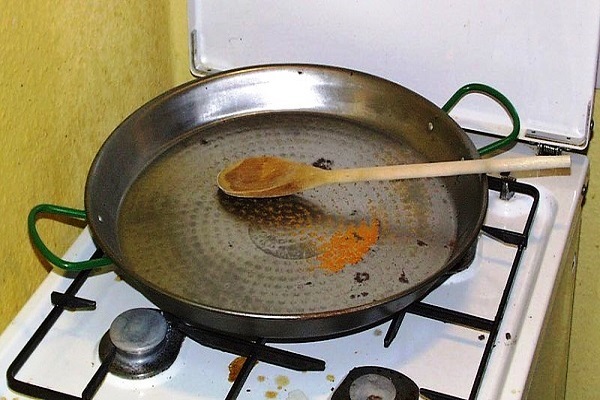 Before the first use of the pan, it should be thoroughly cleaned, the correct method is to pour ¼ inch of water into the pan, add some vinegar and boil the solution, and this will remove the anti-rusting coating provided by the manufacturer. Later wash and clean the pan well with soapy water, then dry the pan with paper towel and cotton towel. Finally rub little olive oil to seal the surface of the pan. After the use, clean the pan with soap and pad, never scrub hard, rinse and dry it with towel, coat it with oil and keep it in a dry place. Wash before using it again. Now this is what is that actually certifies if your paella is a success or a failure. The crisp and golden layer of rice which forms at the bottom of the paellera is called socarrat, it is regarded very highly as a delicacy in Spain, socarrat separates paella from any other rice dishes like Pulao, Tehri or Biryani. The key to achieve the socarrat is that the maximum rice should touch the bottom of the pan and should not be more than ½ inch thick because that’s where all the flavor of the dish lives. After 15 minutes of cooking when the stock is totally evaporated from the paella, see if the rice is sticking at the bottom, increase the flame and cook for 2 minutes, care should be taken or the rice will start burning. Turn the flame off and rest it for 5 minutes before serving, this will settle the flavor and the desired socarrat will be achieved. I think this much information is enough before proceeding for the recipe. Mixed Crustaceans and Mollusks (Scallops, Prawns, Mussels, Clams, Lobster, etc.) 600 grams. Bomba or Calasparra Rice 250 grams. Any Beans (Runner, French, Broad, Butter) 100 grams. Bell Pepper (Red or Yellow) 1 nos. Chives (for garnish) 25 grams. Lemon Wedges (for garnish) 2 nos. Heat olive oil in the paellera and sear the beans and bell pepper, set aside. Sauté the mixed crustaceans and mollusks (Marinara Mix) in the oil for 5 minutes and set aside make sure the tail is intact with the prawns or lobster. Brown the chorizo in the oil for 2 minute so that it develops a brown color, this will impart flavor to the oil, before this you need to slice the sausage into 1 inch pieces. Sauté the chicken for 10 minutes and keep aside. It should not be fully cooked. 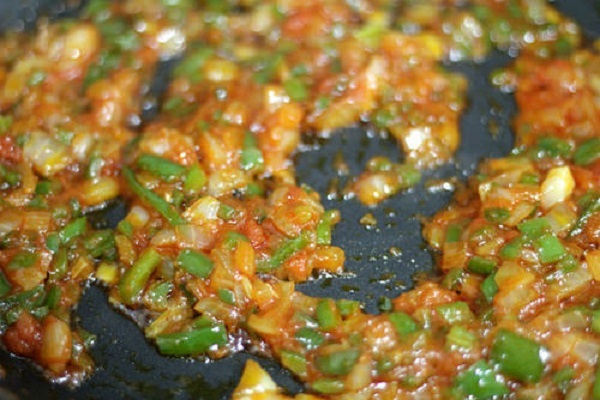 Pour little oil in the paellera and add the chopped onion and garlic, once done add the tomatoes. Cook the mixture for 3 minutes by stirring regularly so the mixture is caramelized (if you want tomato puree can be added here). Now add the chopped herbs and saffron and mix well. At this point add the fried marinara mix, vegetables, paprika and sausage. Now add the stock and salt to the mixture and cook on medium flame for 2 minutes. Add the rice, mix it properly and braise it for 5 minutes without disturbing it so that the rice evenly flattens and settles at the bottom. Give a last stir and simmer on high flame for 10 minutes until the stock is evaporated and rice is almost cooked. Once the rice starts sticking at the bottom, increase the flame and cook for more 2 minutes, this is where socarrat will be made. Turn of the flame and leave it to rest for 5 minutes, cover it with silver foil. Garnish with chopped chives and lemon wedges. 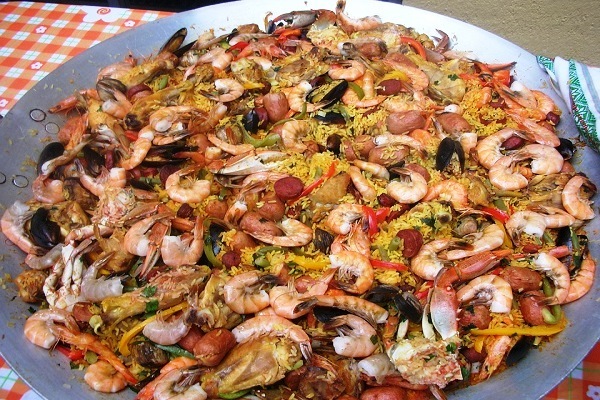 You can serve paella with any red or pink wine or with Sangria and Aioli. Never over crowd the paellera, or else the food will be cooked at the bottom and remain raw at the top. Add proper amount of stock so that it doesn’t go dry in middle of the cooking and if it does add it again but the stock should be hot. Serve the paella with the lemon wedges, never juice it directly before serving. Here is a reference Video for Paella Recipe on my YouTube channel, please watch and subscribe.